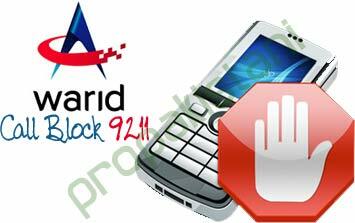 Following the footsteps of Zong, Telenor and Ufone, Warid is soon going to launch the call block service named as “Call Block 9211“, This service enables you to block annoying calls from any number so you can enjoy the freedom of control. The service is in Test phase so its possible that these commands may/may not work. This service is only for Call blocking, Sms service is not included. Update: Rs. 19+tax are charged when you subscribe to this service though Warid representative still saying it costs Rs. 25+tax. For smartphone users such services are useless when they can achieve the purpose using softwares. I use a freeware MCcleaner on my nokia and it works awsome, I can block calls and send sms to spam. Why would I waste my 25+tax =33.75Rs a month. everyone cannot afford a smart phone..with so many crank callers around i think users will be willing to pay any price to get peace of mind. All operators should have this facility including ptcl. Such systems are even available in cheap phones, like nokia 1110 . Cheap chinese phones have this feature, also smartphones aren’t very expensive now, old 6600 is even a smartphone in 2000 in market. Yup 19+tax to be exact. because i have subscribed the service. *Customers can create a block list for the obnoxious caller(s) that will be maintained at Warid’s end which may contain unlimited On-net, Off-net and International number(s). Once subscribed to the service the obnoxious caller(s) will be assigned a default announcement. *Customers can also choose from a wide range of pre-recorded fun announcements against a specific caller(s). *Subscribers have also the option of assigning self recorded announcements (subject to approval) against the obnoxious caller’s number(s). *Customer will also have the option to subscribe to the SMS notification facility through which they can be alerted whenever the obnoxious caller tries to call them. *The service is available for both postpaid and prepaid subscribers. to ap na use karai na. There are different options to get rid of obnoxious calls, you can e-mail or even call PTA helpline too but not everyone common man have acces to internet and emails out there. Its not a force on you to use call block service its a utility for those who want and can afford the services. Even if you dont want to spend charges and you’re being bothered on your warid number or any network number by a warid number, warid offers you to lodge complaint on their own helpline against that number, comparitively other networks donot offer you complain against their network number if you’re being bothered by an offnet netowrk. Respected “Muhammad Zohair Chohan” you should include a comparison of service charges of other networks like zong and ufone giving Call Block Service. In Zong Subscription charges for the Call and SMS Block service — Rs. 15.00 / month + tax. I dont think that this offer by Warid is very good because it is one of the expensive one w.r.t other network’s price comparison. ufone offers to block only 20 local numbers and none of the operator offers an intimation through sms service if you want to know that a blocked number attempt to call you. Reyan, I agree with u when we are comparing service we should include features offered. But in my comment i clearly specified about just “comparison of service charges”. the obnoxious called will be charged as per his tarrif for calling a warid number which has blocked it. Good offer but as usual expensive than others! The main headache is SMS, i get lot of spam messages daily about some boutique, academies, old cars, property etc etc and only zong is proving sms block facility. Warid has some great offers and add-ons/services but because of their poor marketing approach, they have failed to cash them! Can any one tell me how can i get free easyload?? ?